Spoil your senses, indulge your taste buds and explore some of the islands’ famous natural attractions on SeaLink’s new two-day Food, Wine & Natural Wonders of Kangaroo Island Tour. Commencing 1st September 2017, tours depart Adelaide every Monday, Wednesday and Friday. All tours are in an air-conditioned coach with the driver, a Kangaroo Island local, providing informative and fun commentary. Travel to and from Adelaide to Kangaroo Island is by SeaLink coach and a short 45-minute ferry. Accommodation on the island is at Kangaroo Island Wilderness Retreat, which is nestled amongst 113 acres of pristine wilderness and adjacent to Flinders Chase National Park. Kangaroo Island Wilderness Retreat is the perfect location to experience all that Kangaroo Island has to offer with comfortable accommodation, walking trails, abundant wildlife and great food. The two-day Food, Wine & Natural Wonders of Kangaroo Island tour is fully inclusive and focuses on experiencing the islands’ much sought after local food and wine. On day one catch a glimpse of life at Island Pure Sheep Dairy, meet the “girls”, learn about the production, enjoy morning tea, and taste some of the world class cheeses and yoghurts made from 100% ewe’s milk. Next, it’s on to Kangaroo Island Spirits (KIS), a boutique distillery specialising in handcrafted premium Australian Spirits. Taste their gins, vodkas and liqueurs, made using Native Australian Botanicals and locally grown or sourced ingredients. Lunch is a delicious two course meal at the Zone Restaurant situated on Kingscote’s foreshore overlooking stunning Nepean Bay. After lunch head to Bay of Shoals Winery to sample a selection of their award-winning wines while taking in the magnificent views over the vineyards and Bay of Shoals. Spend the afternoon discovering the local successful honey industry – see the bees, learn about the extraction process and taste the honey flavours produced at Island Beehive before heading to the western end of the island, Flinders Chase National Park. Here sip on a glass of sparkling wine while enjoying the picturesque views as the sun sets over Remarkable Rocks. 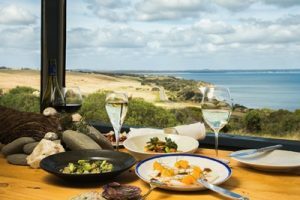 Finish the day back at Kangaroo Island Wilderness Retreat for a delicious two- course dinner using local Kangaroo Island produce. On day two enjoy a continental breakfast before visiting Admirals Arch and Remarkable Rocks on the rugged southern coastline. Watch the fierce ocean swells at Admirals Arch – a spectacular arch and natural nursery for playful Long-nosed Fur Seals, before heading back to Remarkable Rocks to explore the majestic granite boulders and stunning sea views by day. Then visit Kelly Hill Conservation Park and its maze of caves. Sinkholes and caverns lead to caves of ornate calcite formations, and be escorted underground by a National Parks Ranger to explore the largest cave. After working up an appetite at the caves, sample some of the island’s prized freshwater crayfish as part of a two-course lunch at the Marron Café at Andermel. Then it’s off to Raptor Domain to experience the amazing In-Flight Birds of Prey show. See a variety of birds including Wedge Tailed Eagles, Osprey, Sea Eagles, Australian Kestrel, Tawny Frogmouth and Barn Owls. The tour finishes with a quick photo stop at Pennington Bay before heading to Sunset Food & Wine. Here take in elevated 180-degree sea views of Eastern Cove and relax with a glass of wine and a mouth-watering two course dinner, featuring local and regional produce. After dinner, return to the Penneshaw Terminal for ferry and coach transfers back to Adelaide. The Food, Wine & Natural Wonders of Kangaroo Island Tour operates every Monday, Wednesday and Friday from 1st September 2017 and is priced from AUD$725 per person from Adelaide. Prices include morning pick-up and evening set down at selected Adelaide CBD and Glenelg hotels, return coach and ferry travel to Kangaroo Island, two days of expert commentary by a local driver/guide, all activities and meals and overnight accommodation at Kangaroo Island Wilderness Retreat. Visit www.sealink.com.au or contact your local travel agent.